Sorry that this is last minute but our game tomorrow against the Cougars has been downgraded to a mixed scrimmage with them, the Cougars do no think they will be able to field enough players so the more Smokettes that come the merrier. Thank you to everyone who participated in the doodle poll, I thought it went well. 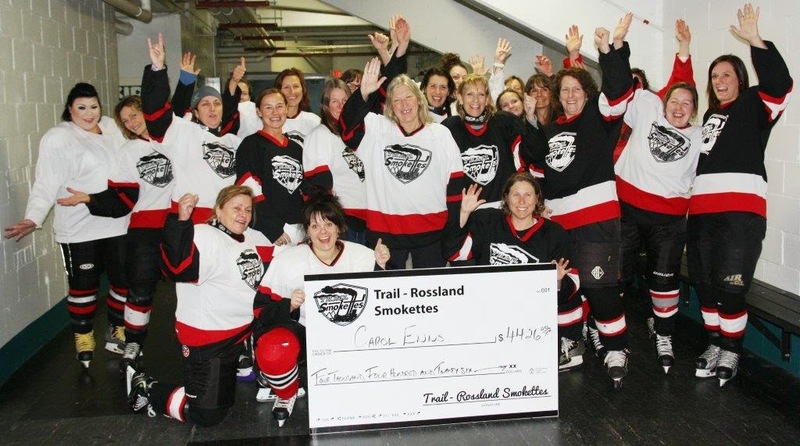 We opened the proceding with a review of the Smokettes Mission statement, which is to encourage fun,recreational, inclusive hockey to all women intersted in joining the team, and to provide financial and physical support throughout the community to those less fortunate than ourselves. Vote for Executive: All Executive members have been nominated, and had their nomination carried by the members present at the AGM. Captain– The Captain of the team runs the team on the ice. The Captain partners players up to create lines, and discusses protocol with the officials. Captains need to have an understanding of game strategy and rules. Assistant Captains provide the same position as the captain, if for some reason she is unable to. The Treasurer maintains the Smokette's banking account, ensures and documents the payment of Team fees, pays tournament fees on behalf of the team, provides information on the revenues and expenditures to allow the executive to make decisions that benefit the financial health of the team. Travel tournament Coordinators recruit players for our away tournaments, collect fees, arrange accomodation and liase with the organizers of the tournaments to arrange playing schedules. 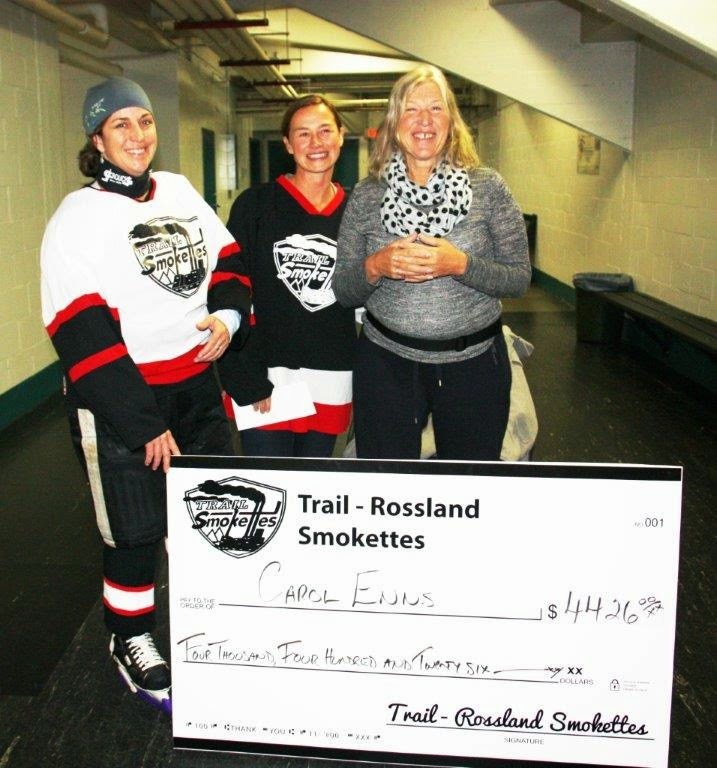 Travel Tournaments Coordinators- Barb Robertson (Creston), Kari Kuznecov and Tracy McCallum (Kaslo ), Holly Jenkin (Grand Forks ) Smokette Round up – TBA. The Smokette's game scheduler contacts other teams in the area to arrange games on our ice times, and on other teams ice times, She also arranges dates for Coaching and skills clinics. Beverage Coordinator arranges the presence of ice cold beverages at a reasonable cost are available after every skate. If you have particualr requests, please have a word with her. Webmaster and Communications coordinator posts all relavent schedules on our team website, www.smokettes.com, and sends out any special reminder or pertainent e-mails through the trailsmokettes@gmail.com address. Charitable Giving Team reviews and presents any community charitalbe giving opportunities for the team, coordinating with the treasurer and other executive of team members. They also facilitate media and community recognition for the charitable work the team does. Uniform and Equipment Manager maintains an inventory of jerseys for the team and dispenses sets to current players every year. Also collects and remits jersey deposits to players. The team owns a set of goalie equipment which the manager also makes availalbe when required. Once the Executive was formed, with the input of attending team members, we came to a consensus for a number of different things. 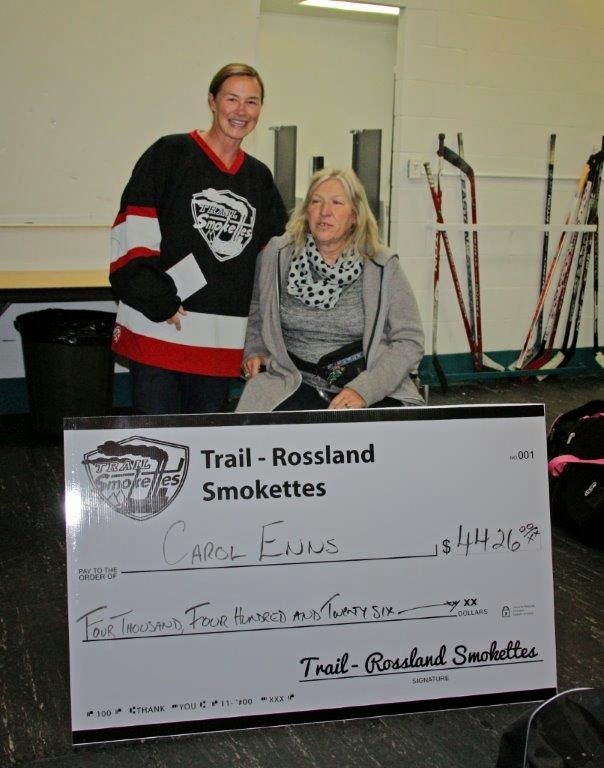 Carol Enns- $4426.00 ( $3500 +$926.00 ), in addition to $1000 already donated. Other charitable giving opportunities.? Please bring them to our attention. Coaching and skills clinics will consist of ½ hour “chalk talk”, followed by 1 ¼ hours of ice time with an emphasis on game related skills. The clinics are free to current members of the Smokette's. Bring a buddy skates were seen as being very highly enjoyed by all. Buddy's play for free. A mixture of co-ed and women's buddy skates is the concensus. We ask that participants in bring a buddy skates be 19 yrs and older. If there is the demand, we will arrange a “family” skate to accommodate younger players. The executive will explore the purchase of another set of jerseys and socks this year, to meet the demand created by increased enrollment, and jersey depletion. The new jerseys will match the older set as closely as possible, for a seamless look to the Smokette Sisterhood. To reduce the depletion of jerseys, each team member will pay a cash deposit of $100 at the beginnning of the season, held by the uniform manager, and refunded when their jerseys are returned in the spring. The figure of $100 was decided by the approximate cost of replacing a set of jerseys. Goalies are an important part of the Smokette's team. In recognition of the speciality of the position played, and the additional expenses incurred by players to gear up to play goal, the Executive decided that goalies would pay ½ of the regular team fee, and play goal in tournaments for free. Due to some players being in Creston for the tournament we have opened up Saturday's ice to Bring a Buddy, all females are welcome and males that play well with others. Goalies are required, any volunteers? The calendar on the website is now updated, a few changes and additions, the most significant is Nov 14th and Dec 5th in Nelson vs the Drillers from 9pm to 10pm. I will send out a reminder when it becomes closer. The Drillers will be at our ice time on Nov 22nd. Finally I am looking at using an app to organize the people that are going to be attending games to make sure that we do not have too many or to few. I am looking at TeamSnap and BenchApp. Does anyone have any experience with either, pros and cons would be appreciated. Reminder: Wednesday October 22nd in Rossland, 8pm start. If you are new we do not play against the guys we split the teams half and half. It is really quite a lot of fun. I trust everyone had a good Thanksgiving. The Smokettes are holding their Annual General Meeting this Wednesday, October 15th, at the Flying Steamshovel, back room. Meet and greet at 6:30 pm, meeting starts at 7pm. This is your opportunity to find out what your hockey team does, other than have a lot of fun on the ice. It's also your opportunity to see if you would like to be more involved with the team, and help us make a difference in our community. Welcome all new and returning members. Present overview of team philosophy ( are we having fun? ), charitable giving, and schedule highlights ( tournaments ). Uniforms: We have 3 quotes, we will need to determine how many uniforms we have, and how many we need. And socks. I hope to see you all there, please forward to anyone I may have missed. Please do not forget to pay for the games that you played on the weekend, check your e-mail for amounts and payment option! Thank you KK for the picture! Hello Smokettes, this is the players’ list for the week-end. Let’s have fun this weekend. Attached is the most up-to-date version of our volunteer schedule for this weekend. I have highlighted areas in red where we still need people. Please take a look and let me know if any of these slots work for you. If you have any questions or comments with regards to the schedule feel free to email/txt me. I will make sure to bring this list to Thursdays ice time as well (7pm in Trail). One last thing…… a small reminder to shine your dancin’ shoes and wash your party pants cause your gonna need’em both this weekend!! !